Newly updated, 5 bedrooms, 5 bathrooms, living room, dining room, kitchen. MW, DW, W/D, 5 Flatscreen Cable TVs, Gas Grill, WiFi. POOL PASS @ DAYS INN. BEDS: 1 King, 5 Queen, 1 Sofabed. Accommodates 14. NO PETS, NO SMOKING. This 3,400 sq. ft. OCEAN FRONT property, completely remodeled in the fall of 2015 and beautifully landscaped, has open floor plan living spaces with 5 bedrooms and 5 full baths. “OCEANS 14” accommodates up to 14 guests and is less than 200 feet from the King Avenue beach access crossover. The 1st floor features Italian porcelain floors, a completely new state-of-the-art kitchen with stainless appliances, over-sized great room and sun room with loads of natural light, and laundry a with new large capacity washer and dryer. There are 2 master bedrooms, 1 downstairs and another on the 2nd floor and there are 3 additional bedrooms and baths; 2 down and 1 up. A 2nd floor sundeck with wrought iron and glass table with seating for 6 is a great place to relax and enjoy views of the dunes and ocean beyond. 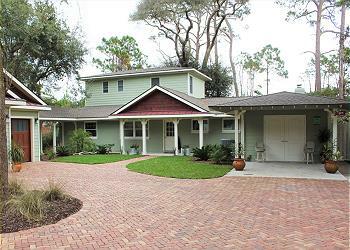 THIS IS THE NEWEST AND BEST VALUE OCEANFRONT RENTAL HOME on Jekyll Island. You won't find a more convenient, comfortable and nicely appointed place to stay during your Jekyll vacation. Amenities include: Direct Beach Access, 5 TV’s (all new flat screens), 2 Blu-ray players, a Fireplace, Full Laundry Room, High Speed Wireless Internet, Cable TV, Gas Grill, Backyard Fire Pit & so much more!!! PLEASE NOTE: Garage not available for guest use. Great time with family and friends- continued tradition started many years ago. The island is mor beautiful than ever. Stayed at this home several times before. Always in wonderful condition, close to beach. This house was perfect for our family of 11 (6 adults, 5 kids). The open living area was great as one can enjoy talking and interacting with everyone while in the kitchen. Loved the piano. Beach access was close by, but be aware that there are 32 steps down to the beach from the crossover. House was clean. Some items need to be replaced or repaired, but overall condition was good. Beds were comfy. Plenty of dinnerware and eating utensils. Oddly, there were only 3 regular spoons with mostly large soup spoons. Otherwise, the kitchen was very well stocked with even a cabinet full of a nice variety of spices. Jekyll' s restaurant choices have improved over the years. Some good ones to try...Driftwood Bistro, Zachary's, and Jekyll Island Seafood Company (best gumbo, ever) to name a few. Bike rides daily on the awesome bike paths. Hours on the beach (at low tide). Overall, a wonderful place to make memories with your family. Our entire family was able to come together and really enjoy the holidays for the first time in a while. With everyone in different cities, this home allowed us all to have our on room but a huge kitchen and family room to sit and cook together. We really appreciate the stay! We were called two weeks before our stay and asked to move to a different house which was a strange request. Had we moved homes, I don't think our experience would have been nearly as incredible. Great home, large open living area with wonderful, fully stocked kitchen. Comfortable beds. Close to beach crosswalk. Highly recommend. Would rent again. Well maintained property. The house was very comfortable and fit our needs. The location and access to the beach were great. JekyllRealty was very responsive to our needs. The kitchen coul be better supplied with a large pot and large bowls. Jekyll Realty folks are very accommodating &helpful. They had Oceans 14 clean & ready for us when we arrived. We greatly enjoyed Oceans 14 during our stay. Its a beautiful home located on the beach. If our golf tournament comes to Jekyll again next year, we will plan on renting again. Really nice renovations. Very comfortable accommodations.